The pristine vehicle interiors shown in car ads and marketing are far from realistic. In real life, dirt, disorder and insufficient storage plague millennial and Gen X drivers, according to a study jointly published by Vizionation and Pay Your Selfie. Examining hundreds of cars, researchers found vehicles are environments that reflect everyday life — only more chaotic and unclean. The visual study was based on hundreds of car owners between the ages of 25 to 54 and 1,200 photos of their car interiors and home environments. Cars are intensely private habitats, an extension of everyday life, says Barry Robertson, Vizionation principal and study co-author. Automakers need to have an authentic understanding of the untidy behavior in order to be more credible with car buyers, he adds. The report spotlights how cars are tasked to function as extended homes on wheels: busy mobile hubs where drivers and riders frequently eat, do business or homework, and groom themselves while traveling. Yet cars perform these secondary duties sub-optimally, given storage limitations and a lack of accessible solutions for keeping interiors clean and chaos-free. The impetus for the survey was to study how autonomous vehicles could radically change the way car interiors are configured. By the time self-driving hits critical mass, millennials will be in their late 30s, 40s and early 50s; together with Gen X, they will be the dominant force in the U.S. new vehicle market, Robertson says. In 2017, only about 15% of new car sales were accounted for by buyers aged 35 and under. After working with automakers and their ad agencies for most of his careers, one thing Robertson says he has learned is that engineers, designers and product planners —including automakers and key suppliers — drive the marketing process. “We designed the study with both brand and product decision-makers in mind,” he says. The study, “An Inside View: Car Interior Scenes & Secrets,” is based on in-depth explorations and surveys conducted between March through June 2018. A panel of 100 vehicle owners ages 25 to 54 with household incomes of $50,000 and above participated in multi-step photo surveys on vehicle interior storage use, satisfaction, organization, pain points and desired improvements. Additional photo surveys confirmed the importance of car interior storage and the “embarrassment factor” of dirty or disorderly vehicle spaces. Drivers spend about an hour and forty minutes in their cars each day, Robertson says. (NEW YORK CITY – CHICAGO – BOULDER) – December 4, 2018 – A new visual study based on thousands of car interior photos reveals a hidden reality inside consumer vehicles: dirt, disorder and insufficient storage plague Millennial and Gen X drivers in America. The study, jointly published by Vizionation and Pay Your Selfie, is based on analyzed data from hundreds of car owners between the ages of 25 to 54 and 1,200 photos of their car interiors and home environments. The report spotlights how cars are tasked to function as extended homes on wheels: busy mobile hubs where drivers and riders frequently eat, do business or homework, and groom themselves while traveling. 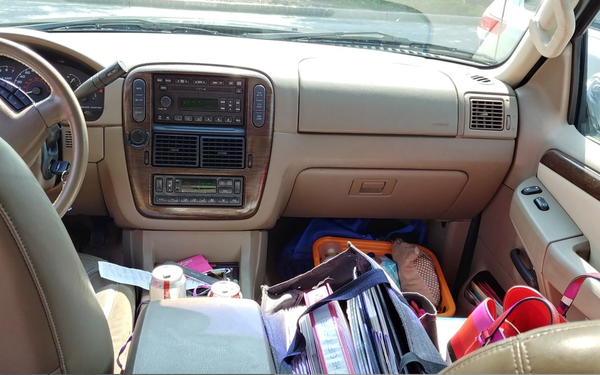 Yet cars perform these secondary duties sub-optimally given storage limitations and a lack of accessible solutions for keeping interiors clean and chaos-free. The study, “An Inside View: Car Interior Scenes & Secrets,” is based on in-depth explorations and surveys conducted between March through June 2018. A panel of 100 vehicle owners ages 25 to 54 with household incomes of $50,000 and above participated in multi-step photo surveys on vehicle interior storage use, satisfaction, organization, pain points and desired improvements. Additional photo surveys confirmed the importance of car interior storage and the “embarrassment factor” of dirty or disorderly vehicle spaces. It is available for purchase at Vizionation.com. Vizionation™ publishes high-value and cost-efficient qual-quant research reports across a wide range of categories and topics. Led by career automotive industry and marketing experts, it is the inter-generational consulting and research arm of Boomer / neXt, LLC. PayYourSelfie, Inc. (“Pay Your Selfie”) specializes in ethnographic mobile surveys that humanize data about people’s attitudes, behaviors and lifestyles. It analyzes longitudinal “in-the-moment” photos and survey data from a proprietary panel of 200,000 U.S. consumers, enabling marketers to visualize and better understand consumers’ worlds.